I had no idea this decorated pattern even existed until this ice green pitcher sold at the 2013 International Carnival Glass Association convention auction for $170. 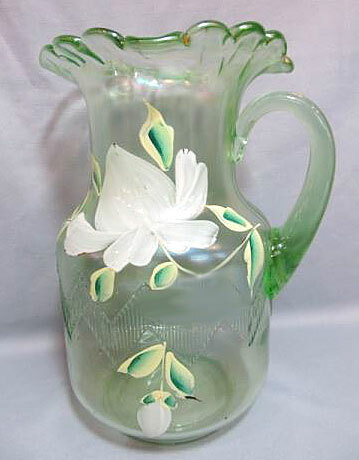 Note that it is very similar to the Enameled Crocus pitcher shown on that page. I'm not sure that there might have been a bit of a mixup on the part of the auctioneer. 6/26/16 Here is another pitcher listed as Orchid. This one seems to more properly reflect the nature of the flower. 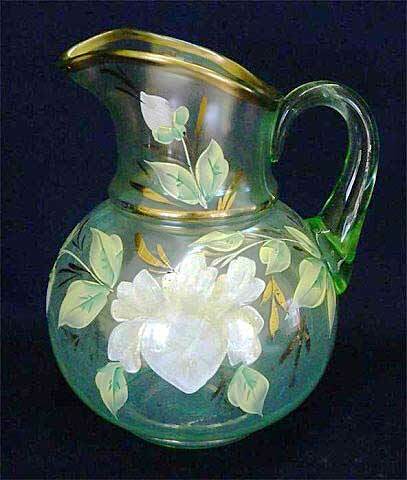 It is on a Fenton Zig Zag ice green pitcher and sold for $155 in 2014. Two marigold water pitchers listed as Orchid sold in 2014 for $50 and $135.